PT Bank Negara Indonesia (Persero) Tbk – BNI (IDX:BBNI) or know as “Bank BNI” is one of the largest public-listed banks in Indonesia which is majority owned by the Government of Indonesia. As today, the Government of Indonesia holds 60% shares in Bank BNI which represented by the Minister of State-Owned Enterprises (SOE). Other 40% remaining shares in Bank BNI was owned by general public and investors, comprise of 8.3% domestic investors and 31.7% foreign investors. Based in Jakarta, offers a full range of general banking products and services. Its products and services include personal banking, priority banking, business banking, international banking and treasury. 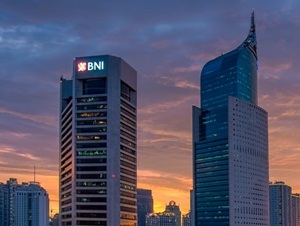 As of December 2017, Bank BNI has 17 regional offices, 200 domestic branch offices, 6 foreign office networks, 1,085 sub branch offices, 595 cash offices, 17,966 ATMs spread in all over Indonesia. In term of financial performance Bank BNI succeeded in posting a positive financial performance in the business year of 2017 (ended in 31 December 2017). Bank BNI booked total assets of Rp709.33 trillion in 2017. This number is up 17.62% year-on-year (YOY) from Rp603.03 trillion in 2016, according to information found in PT Bank Negara Indonesia (Persero) Tbk Annual Report 2017 as cited by JobsCDC.com. Referring to its annual report, Bank BNI managed to record total profit of Rp13.77 trillion in 2017. This total profit number is up 20.68% from Rp11.41 trillion in the same period previous year. Male : minimum 165 cm. Female : minimum 157 cm. Age 18 to 25 years old on 11 November 2018. SMA or equivalent : minimum average report card on 5th and 6th semester of 7.00. D1 – S1 : minimum GPA of 2.50. Single/not married and willing to not get married during internship period. Physically, mentally healthy and not collor blind as evidenced by notice letter of health condition from doctor. Never involved in drugs and other violations of law as evidenced by SKCK.